From our point of view, markers are something more than only common, thick felt pens. Trainers, advisers, facilitators, teachers, coaches, visualizers, designers, students and all those who have understood that using markers can make a difference. Visualization will soon become one of the management skills, that’s why markers are undoubtedly a management tool of the future. Those who comprehend how to visualize a big image in people’s minds, will have much easier to inspire them to follow the same way. Information on our reduced color range can be found at Markerpedia. Empty AcrylicOne marker for filling and mixing colors yourself. Empty marker for filling and mixing colors yourself. Empty Acrylic One marker for filling and mixing colors yourself. Fine, refillable Acrylic-Marker filled with 3 ml acrylic paint. Medium, refillable Acrylic-Marker filled with 6 ml acrylic paint. The Neuland FineOne® Estatics markers are the ideal writing companion to our Estatics. 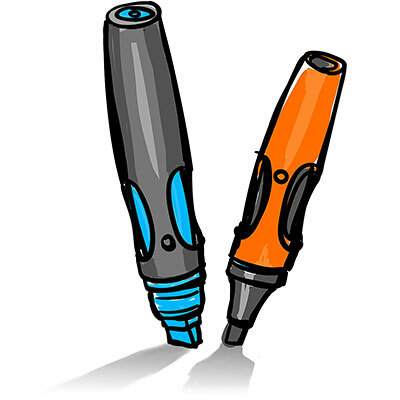 The Neuland No.One® Estatics marker is the ideal writing companion to our Estatics. Empty pump-valve marker with a super-sized 50 mm writing nib. Empty pump-valve marker with a super-sized 30 mm writing nib. No.One in the unfilled version - fillable with water-based ink RefillOne. Neuland FineOne® round nib in the unfilled version - fillable with water-based ink RefillOne. Neuland FineOne® Art in the unfilled version - fillable with water-based ink RefillOne.